About half the people in Alaska live in a single city, Anchorage. It is a good base for us. We have a regular house, with luxuries like hot running water, but for years we lived in a Quonset hut in the Chugach Mountains east of the city. We hauled water and started a wood fire every morning and evening to stay warm. 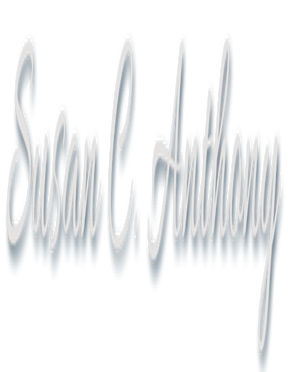 It was difficult in ways, but it enabled us to save the money that freed us to travel, start my book business and retire from teaching. It kept life simple and helped us learn to appreciate small blessings others take for advantage. Only one road goes south from Anchorage and only one road goes north. It's hard to imagine how the city could ever be evacuated in an emergency! Anchorage is trapped on a point of land between Turnagain Arm and Knik Arm, with Cook Inlet to the west and the Chugach Mountains to the east. The following stories are in reverse chronological order, with the most recent ones on top. To read the stories chronologically, click the last story and each page will thread to the next. I'll add more stories to the top of the list as interesting things occur. Will the Real Moose Please Stand Up? 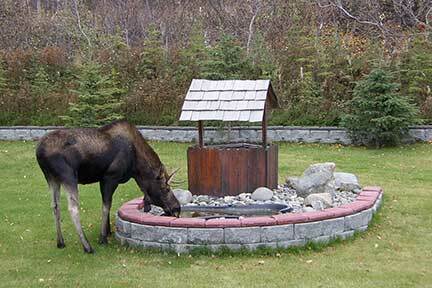 Speaking of moose, there are actually more wild animals in Anchorage than there are at our homestead and other wilderness locations we visit! That's because no one hunts in town. When we plant decorative trees, we have to wrap everything with netting so the moose don't devour them immediately. We frequently have moose in the yard such as the one in the photo. They aren't the least afraid of us or the dog. We've seen them with tiny newborn calves that race around and play. It may have been inevitable that moose would discover that, despite the risk of being hit by cars, it is safer to raise calves in the city. Fewer natural predators. Eventually the predators moved into town. We returned some years ago from a trip to our wilderness homestead. Friends living in our basement said they'd come home late one evening to find a grizzly bear chasing a moose around the house! They positioned their vehicle to impede the grizzly and give the moose a chance to escape. A year later, Dennis noticed crowds of kids on the roof of a nearby middle school, looking and pointing toward the woods. He later learned that a grizzly bear had been feasting on a moose calf near the playground, with the bereaved cow in the near vicinity. I suppose the lesson that day had something to do with the food chain. One year, our dog treed a lynx on one of his walks in the neighborhood. After that, we joked about him "searching for the missing lynx." If wild animals don't keep things interesting, there is always the potential for an earthquake or volcanic eruption. In 1990, my fourth-grade class was studying volcanoes when Mt. Redoubt erupted. We watched from the classroom window. One of my newer students was amazed. He wrote in his journal, "I have never lived in a city with its very own volcano."